This is Frances, doing some posting (in the photograph above) and (below) getting a rare ‘post’ in edgeways! I wonder how many of all those wonderful people who order our books realise how the parcels begin their journey. Post Offices all over the country have been disappearing to the distress of many – and then sometimes they reappear in unlikely guises in pubs and even churches, I understand. 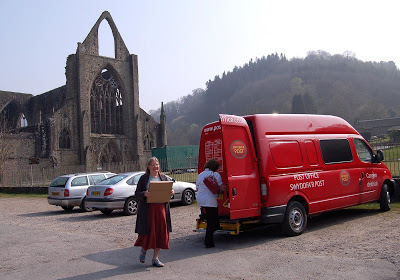 Ours was for a short time a part of a pub which then closed down and now we have what must be the most spectacular of all post offices – this van in the car park next to Tintern Abbey. It travels to several villages and at the appointed hours appears here on all weekdays except Wednesday. Though one might be a little doubtful of the efficiency of such an enterprise, we have known parcels to leave Tintern at 3.30pm and be delivered in Orkney the following day. Journeys to London sometimes take a little longer even though it is so much nearer. Keeping down the costs of sending parcels is one of the constant tasks of ‘the other half’. We have recently discovered that for parcels containing more than a single book (up to 10kgs) they can be collected directly from the house and delivered in the UK within 48 hours for about £8 which seems good. Overseas is not so easy now because the firm with whom we have dealt for many years has just been taken over and is causing us nightmares with soaring prices, lengthy delivery times and staff who don’t seem to know what they are doing. I hear you say, like most take overs . . . perhaps, but not with our books please! The post office van takes away all our mail and parcels of single books (which is the greater part of our operation given that we mostly function as a mail order company) – so, long may they flourish and keep going in these difficult times.